Over the course of my first semester at IU I’ve done quite a bit of exploring throughout our 2000-acre campus. From the quaint corner coffee shops to our architecturally magnificent buildings, Bloomington has so much to offer. 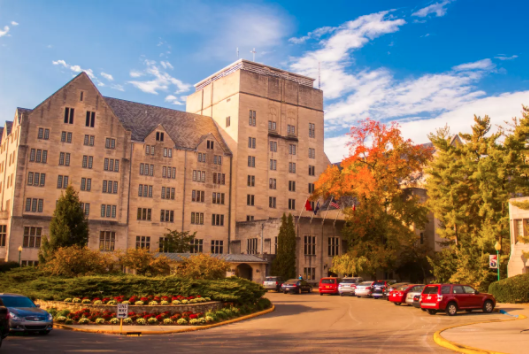 With such a beautiful school like IU it was difficult to choose only five, but here are my five favorite places to study—or just chill. Enjoy! Built in the 1930s, the IMU is one of the largest student unions in the world. Comprised of a hotel, multiple coffee shops, auditoriums, a bookstore, and more, you can find yourself walking through the Hogwarts-esque halls for a multitude of reasons. I often find myself visiting this 500,000 square-foot building for a chai latte from Starbucks and to study in the union’s well-known (and incredibly gorgeous) South Lounge. Seriously, the fireplace, leather couches, and exposed wood give off a Harry Potter aesthetic. 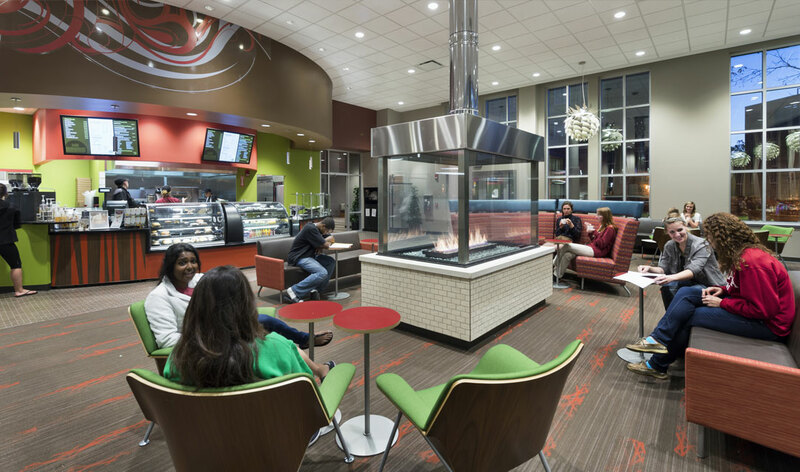 Inside the Forest Residence Hall are The Restaurants at Woodland—aka the best place to grab a meal when using I-BUCKS. Your options are seemingly endless, from burgers at The Stone Grill to smoothies at Bloomingberry. 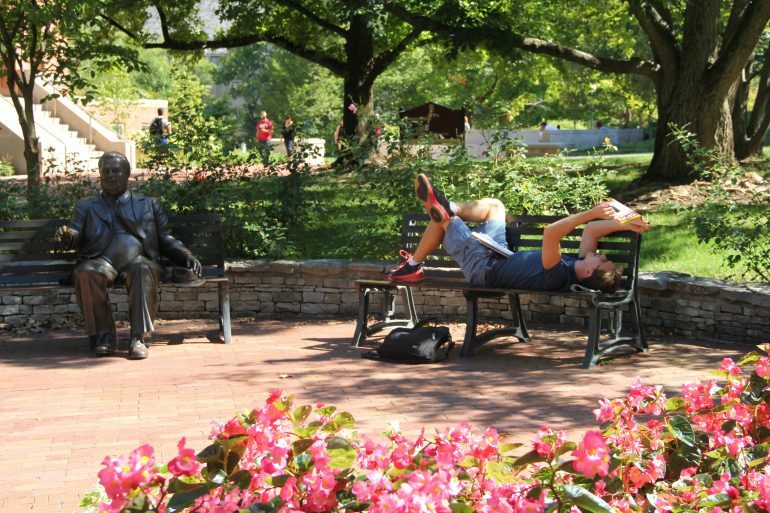 Not only does the Southeast neighborhood offer the best dining options, but it’s also home to some great study spots. My favorite spot in the building is the coffee shop/study lounge, The Round. With its floor to ceiling windows, grand fireplace, and relaxing atmosphere, it’s beyond easy to get into a groove and knock out your studying. There’s even a piano in the corner that Jacobs kids love to practice on. Ordering a coffee, grabbing a table, and cranking out my work for the day has become so routine for me. It’s one of those places on campus where you’re comfortable, yet studious, all while being 20 feet away from a great meal when you’re hungry. 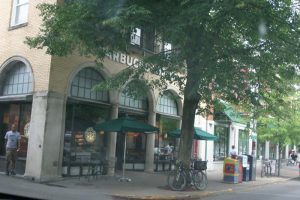 Starbucks is a staple at many colleges across the U.S., and here at IU there’s no exception. Just off Kirkwood you can experience the smell of coffee and croissants, the hustle and bustle of people on their way to and from class, and the multitude of people nose deep in their work. The collegiate aesthetic is so pronounced and is exactly how you’d imagine a Starbucks coffee shop on a large college campus. If I’m outside of the Sample Gates and in need of a chill study spot, I guarantee you I’m here, perched by a window doing work. The softly playing alternative music and whistling of the espresso machine create the perfect environment if you’re tired of studying in your room. Just beyond the limestone Sample Gates is the beloved Media School. 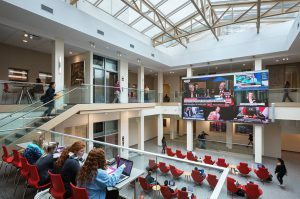 Renovated in 2016, Franklin Hall exhibits state-of-the-art technology including, but not limited to, a 24-foot-wide news/television screen suspended from the ceiling. The sleek layout, quiet atmosphere, and natural light from the glass skylight always produce a sense of calmness. The Media School is a wonderful place to relax if you want time to yourself to study, watch the news, catch up on your latest Netflix addiction, or meet up with a friend. Opened in 2015, the SGIS building is also one of IU’s newest additions. The three-story space, complete with numerous private study rooms and an enclosed atrium, is a popular spot for students and faculty. Many of my classes’ review sessions have been held here and I also spend a great deal of time studying within these walls. If you’re lucky, you can find an unoccupied focus room, close the door, and crank out your assignments or work on a group project. Considering its proximity to Wells Library, the Kelley School of Business, and the overall Northwest neighborhood, the SGIS location is hard to beat. 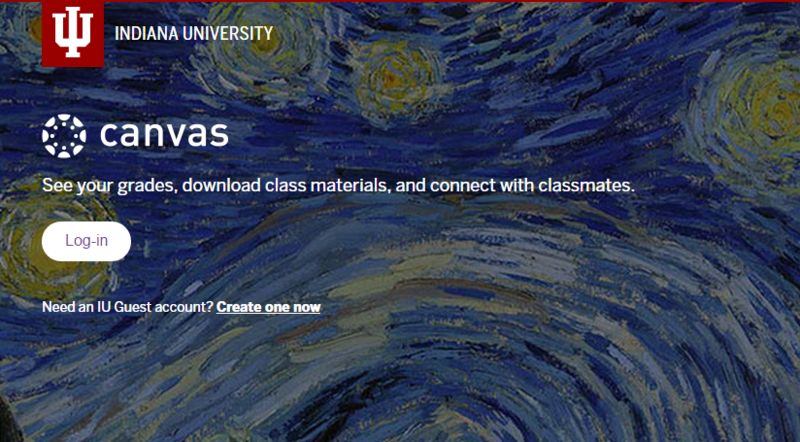 Thanks for reading and go Hoosiers! Hey Hoosiers! 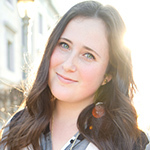 My name is Jamie Skigen and I'm beyond excited to be blogging for WeAreIU! I'm a Media BA major and plan to graduate in 2021. I love to write, travel, and eat my way through 4th Street!